PERFECT FOR BEGINNERS | Given its range, this model is perfect for performances when a brief chime effect is needed. 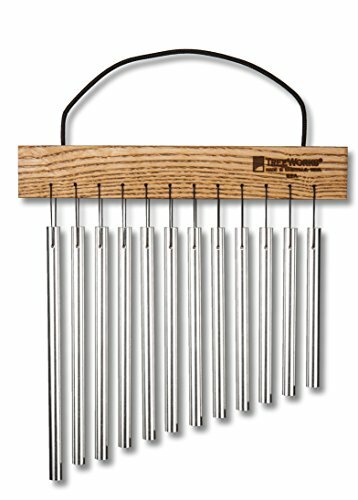 As one of our smaller models, this chime is convenient and versatile, making it a great choice for beginners looking to add some shimmer to their music. A CHIME YOU CAN HOLD IN ONE HAND | This is our only chime suspended from a braided nylon cord and the only model that can be held in one hand. Our braided nylon cord handle is one of the strongest and most durable cords available and is designed to withstand the test of time. HAND-CRAFTED FOR SUPERIOR DURABILITY | Long-lasting braided CordLoc is used to susped our 3/8" thick Aluminum/Titatnium alloy bars on a hand-finished Tennessee hardwood mantle. Unlike other brands, we always source our materials locally and reject the use of plastic ties to secure our bars to our mantles. DIMENSIONS | The TRE415 is 10 x 3 x 3 inches in dimension.